I just got back from York last weekend where I spent some time in the city getting to know the people, and then I went and helped at an organization that provides services for people in need. 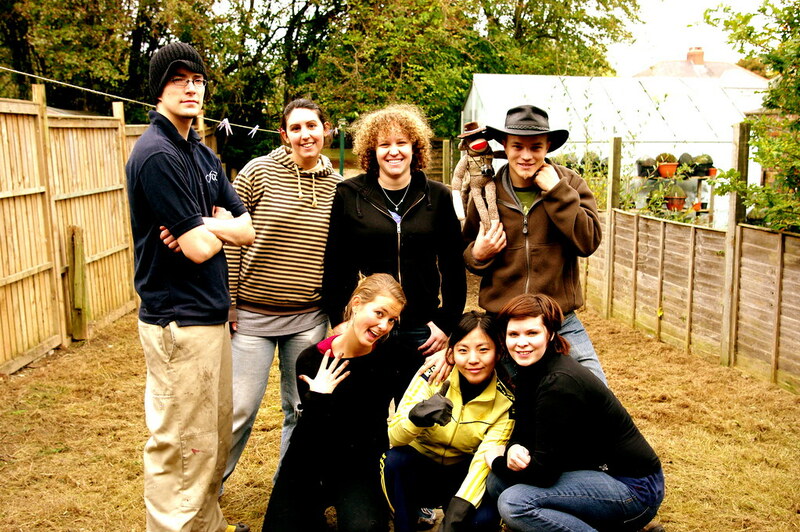 That particular weekend we were gardening in a home for a single mother. 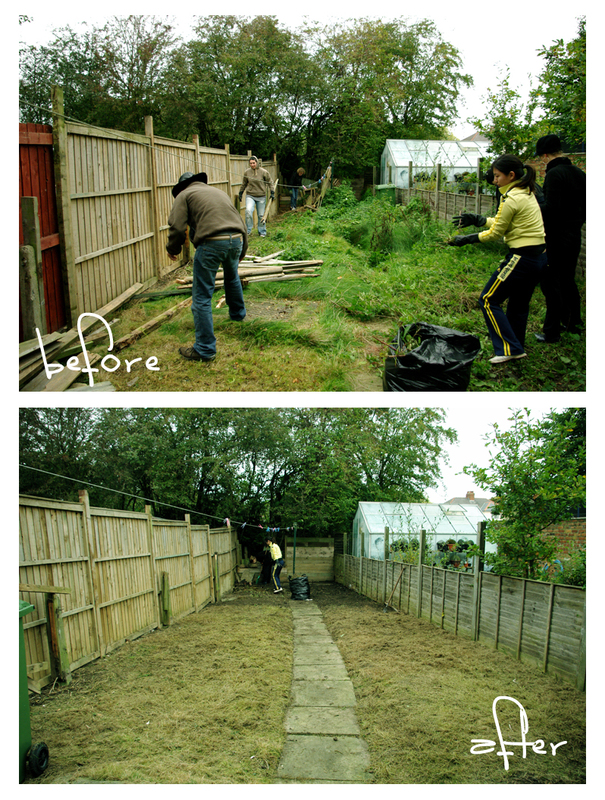 The yard was a jungle! Here is my wonderful team! I can't believe how long it has been since I last updated my blog! It's been a busy couple of weeks, folks. Before I get into this blog, I want to share briefly what I have been up to in the last three weeks. 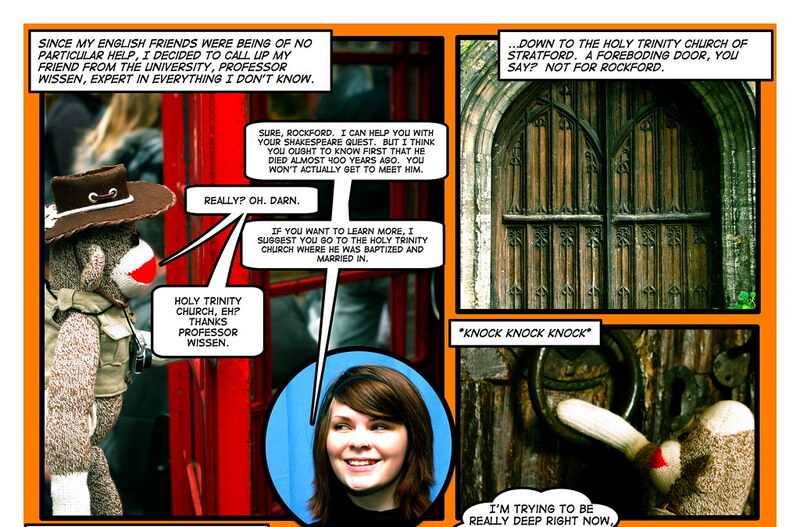 My main goal has been to research England, and immerse myself into the culture. - AM/PM? Forget about it. Everything is the 24 hour clock here. And if you go to buy a ticket at the train station, and the clerk says "14.25" Clarify if he means 14:25 (2:25PM) or $14.25. I've had some angry words from train station attendants for that one. - Pedestrians have the right-of-way? Doesn't seem so. In fact, more often than not, cars have sped up when I try to cross the road at a cross walk. Maybe they are just racist against Sock Monkeys. - Tipping isn't mandatory at pubs. - Everything (except for the Pubs) closes at 8:00. Or if you are in a smaller town, it's 6:00. Oy. The Great Court, nor the Reading Room however, were the subject of my visit. I was there to find out about British History. But I was about to be royally confused. The first room I wandered into was fantastic. Huge Egyptian stone statues of Ramses II. A smattering of sarcophagi. Walls and walls of Egyptian stone hieroglyphs. The Rosetta Stone. Heiroglyphs? Sarcophagi? And since when was Ramses II the king of England? These British people... they've got some research to do on their own history. Last I checked, it was the Ancient Egyptians who wrote in hieroglyphs. 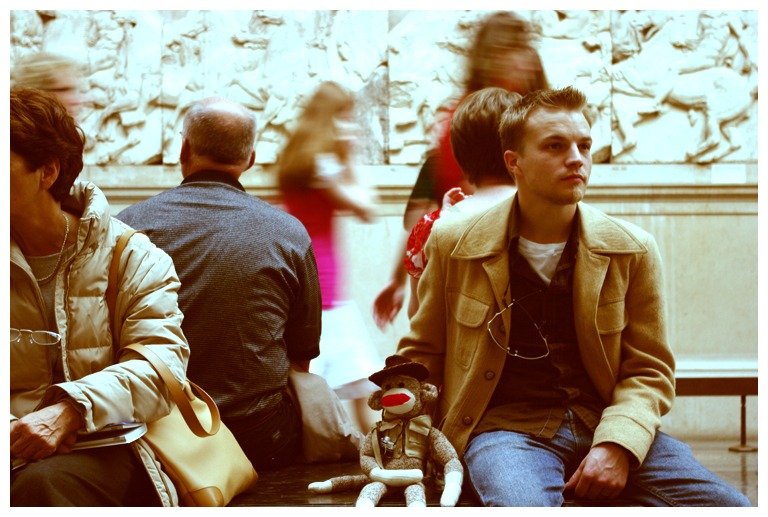 I continued on my search for British History, in the British Museum. I was really starting to wonder at this point, what the British people thought was their history. 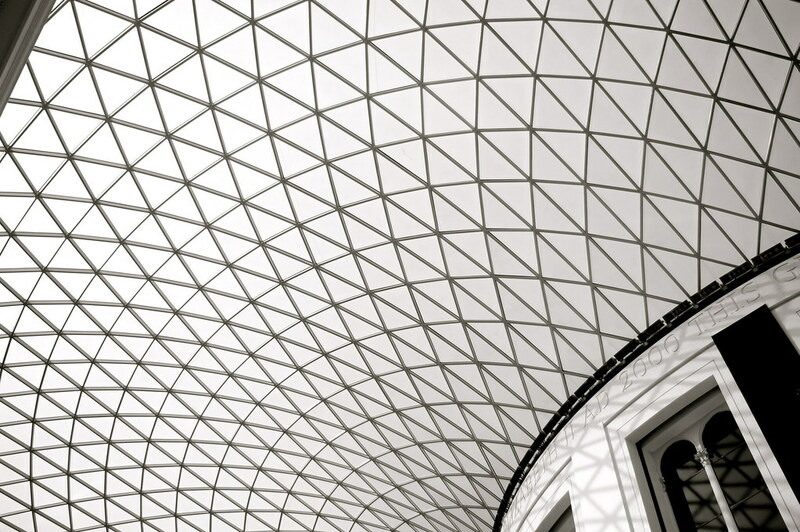 On with my search for British History at the British Museum. At this point I was starting to doubt whether or not the British Museum actually held true to it's name. My quandary was continued, as I entered the next room which housed more Parthenon sculptures than the Parthenon. 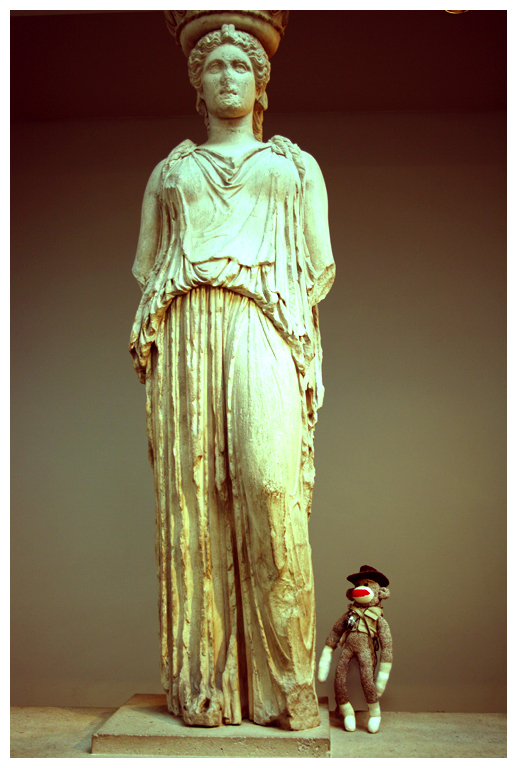 Now why, I asked myself, would the British be boasting substantial Ancient Grecian sculpture in their British Museum? How do their histories link? And how is it that the British Museum has come to house the most Egyptian Antiquities outside of Cairo itself? How is it that it's the British Museum that displays the Rosetta Stone, one of the most important pieces of Egyptian History? All of these questions, I've found, point to a man named Sir Hans Sloane. To make a long story short, (and I know you'd love to read the long story, so go ahead and look him up on Wikipedia) he fancied himself a collector of curiosities. And apparently in those days, valuable pieces of Ancient Civilizations were considered curios. And upon his death, at the ripe old age of 92, he bequeathed his entire collection to Britain. To this day, the ownership of many pieces in the collection are wildly contested by the original countries. Well ladies and gentlemen, I feel as though the search for British History has just begun. It's a good thing I'm here for a while. On another note: While I was at the museum my bag got stolen. I think it was this guy to the right of my in this photograph. Look how close his hand is to me. It’s London, everyone! But only the Readers Digest Version. Well, Horley aside, I decided to spend my second day getting acquainted with London. Even though I was still mostly jet-lagged, I felt it was definitely advantageous of me to get the London low down. I did not feel as out of place in London, as there are creatures from every creed & colour. I’d put money on it that I heard more languages that day in London, than I will hear my entire trip. I started my trip by wandering in a circle trying to find street signs. *Note to anyone traveling to England--street signs are not their specialty*. Once I was oriented, I started my journey. I made a point to avoid the tourist trap things. A lot of them are quite overpriced (£25 to get into an exhibit! Sounds alright...but then double it for Canadian funds. Oy!) Something handy for travelers to know however, is that all museums in England are free, so I’d advise hitting those first and then seeing if you are still interested in going to the Clink Prison exhibit, or the Jack the Ripper walking tour (I’m actually quite tempted, I must say). 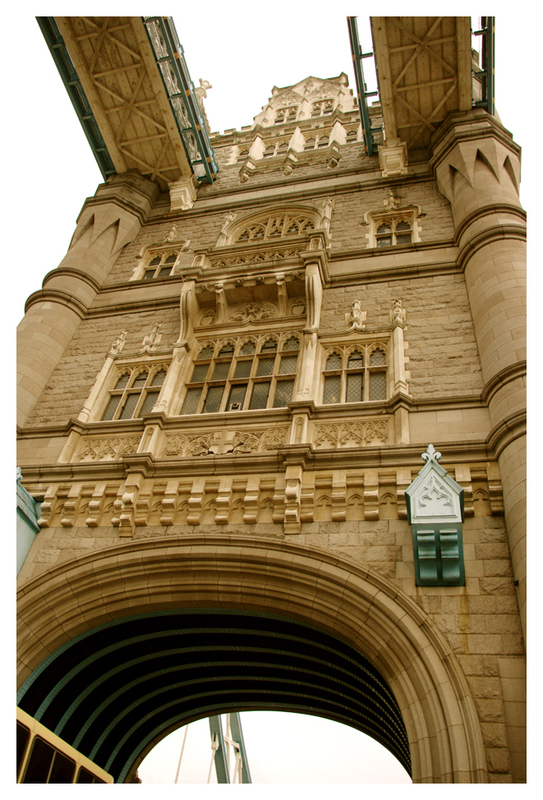 Tower Bridge: This is the bridge that everyone calls the London Bridge. It is not. London Bridge is actually quite ugly and industrial looking. Tower of London: Chalked full of history--(the mish-mash of styles makes that obvious) This is something that when I get the chance, I’d like to take the tour. This is right by the Tower Bridge on the North Bank. Clock Tower: Everyone calls this Big Ben--but that is the nickname of the Great Bell within the tower. It is the largest four faced chiming clock in the world. Houses of Parliament: Self explanatory. Clock tower is connected to these. Harry Potter flew past them in Order of the Phoenix. Westminster Abbey: Beautiful. But they charge £14 to get in. Or, you could just go to a Sunday service for free. Green Park: It’s right across from Buckingham Palace. I thought it was fantastic--I’m told it doesn’t even compare to Hyde Park though. The town is quite overwhelming and obviously I wasn’t expecting to really see a lot in just one day, but I did want to soak in as much as I could. I will definitely go back and write a much more in depth blog, but for now you get the readers digest version. I hope you enjoyed it! Well, my bags are packed. I'm ready to go. And I'll stop there, before I become the 899th person to cover "Leaving on a Jet Plane". Though there were a few complications (flight was changed a total of three times...the last one being when I was waiting to check my luggage) I am here. In the airport. Waiting. I always find flying to be a little awkward. 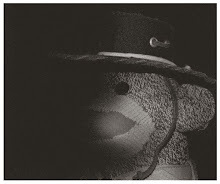 As a sock-monkey, you always get a slough of questions. "...And what nationality did you say you were?" "Are you here by yourself?" "You want to bring an elephant as your carry-on?!" (Umm...maybe that one is just exclusive to me) "Did you have to pay full price for your ticket?" (Obviously! Did you? Why do people ask me that? Are they trying to say something about my size?!) Anyway...here I am. There's not much to say about the airport. It's the same as always. Expensive shops. Nervous people. Nervous people who by stuff at expensive shops because they can't stand waiting. You know the drill. Well, with all that said, I believe I'm going to go check out the Gucci shop. One hour left, and I hate waiting. But I’ll be darned, it sure is pretty. Last weekend I got away on my own to make the final plans for my trip. So I headed on down to Ocean Shores, Washington to spend some quality alone time thinking about my upcoming trip. 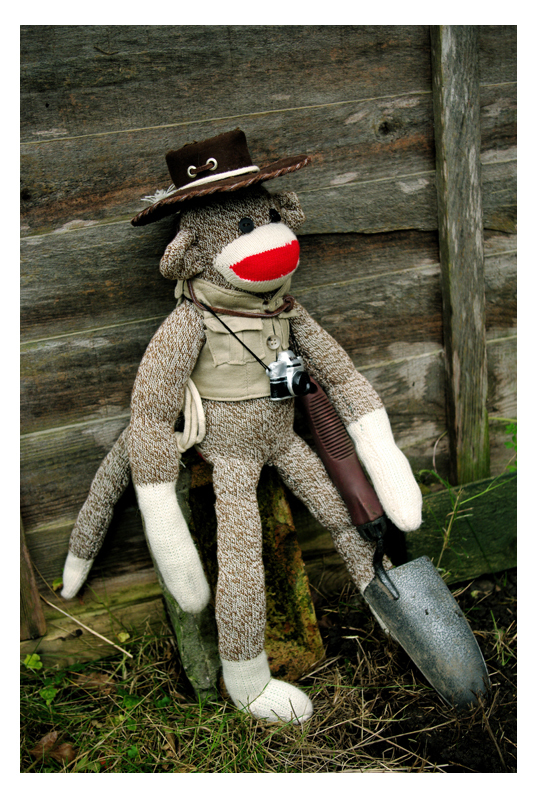 I’ve been quite the busy sock monkey in the last couple months, teaching a summer course on Ancient Mermaid Mythology, training the Canadian Search & Rescue in the art of spelunking, and trying to paper train my pet elephant-- so I apologize for the lack of content on my blog. Of course, once I leave, the blogs should become a lot more regular. But anyway, back to Ocean Shores. It’s a pretty tiny town--consisting mostly of hotels built in the 1960’s & 70’s. It was formerly a large ranch, and was bought by a corporation to start a town. Apparently it was quite a hot spot in the 1960’s and celebrities flocked to it. Even Pat Boone made it his official residence in 1967! 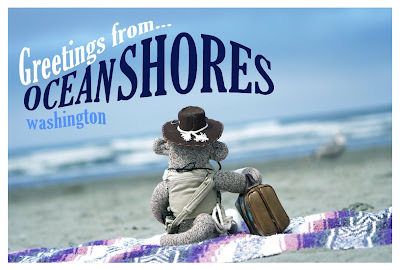 Today, however, it’s a quaint little seaside getaway with miles and miles of sandy beaches (albeit, foggy sandy beaches) Thus earning the name, Ocean Shores. Dahab, Egypt: Apparently this is a small hippy/surf/scuba village in Egypt that is well known for it’s cheap hotels, fantastic scuba diving, and laid back atmosphere. Crete, Greece (Greek Islands): The center of Europe’s most ancient civilization, Minoan. I’m interested in seeing some archeological sites there, particularly the frescoes at Knossos. Zurich, Switzerland: The Grossmünster, a church built in the 1200’s, which was an important site for the Protestant Reformation. ...And the list really does go on forever. But just you wait! It will be a whole lot more exciting when I post something on the towns once I’ve visited them. I'm going to let you in on a little secret: I was in the original cast of the first season of Survivor. When the rest of the cast found out they would be competing against a real live Redheel, they mutinied and I was cast off before the show even started. I was too much of a threat--they must have realized that the competition wouldn't have even been fair. Despite all that, I have remained a loyal fan. Last night was the season finale of "Fans vs. Favorites" and I was disappointed my favorite (The Ice-Cream Scooper) didn't win--but it sure was an exciting season. 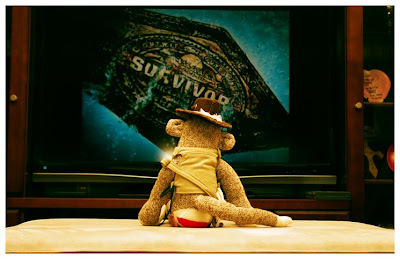 I'm going to miss next season, because I'll be out making my own Survivor--umm... sans the major TV studio, expensive cameras, medical crew, and porcelain veneered host. But really, who needs Jeff Probst when you have Rockford Bernstein? 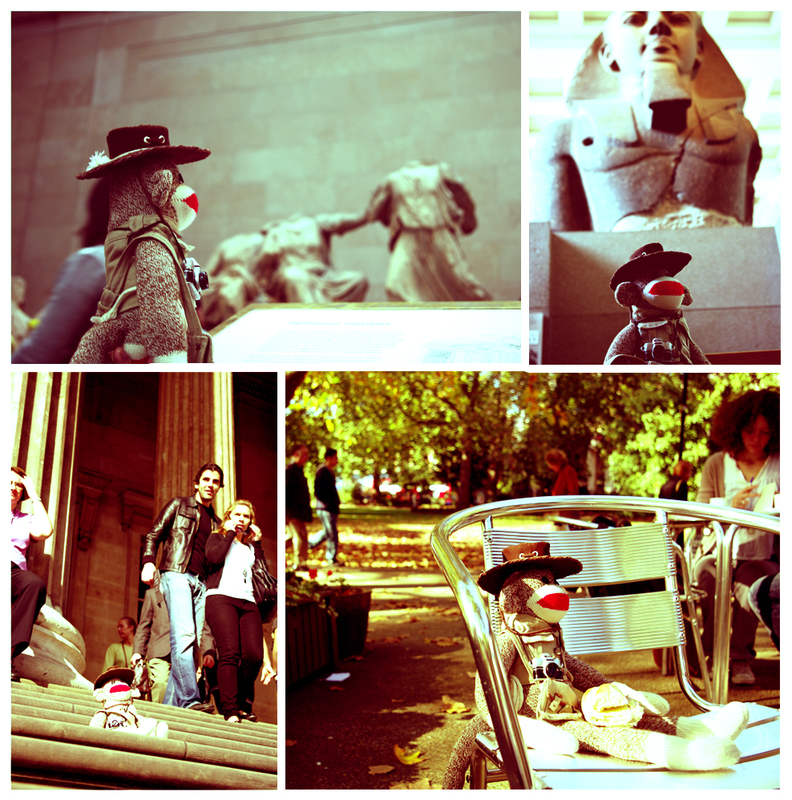 It's clear when one first meets him, that no other sock monkey in the world is more cut out for adventure seeking than Rockford Bernstein. From an early age, Rockford had an interest in world history, culture and travel. With the encouragement of his adoptive parents, Rockford attended the prestigious Redheel University, with a triple major in Anthropology, Ancient Biblical Texts & Artisans of Ancient Sumeria. Rockford's schooling plays a large part in his adventure seeking--his personal motto being, "Don't just see the world--know the world." Rockford is also an avid outdoors-man, having spent numerous years as a guide in Northern British Columbia, and the Yukon Territories. 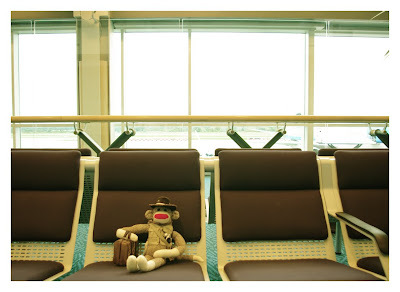 Rockford currently resides wherever the heck he wants to reside, because globe trotting sock monkeys never settle. Favorite TV show(s): Digging for the Truth, Pilot Guides, Mythbusters, Coronation Street. What the heck have I been talking about?! Want to be on a mailing list? Have any suggestions for my travels? Email me! Time is ticking away, tick tick ticking away! till Rockford heads out on his backpacking tour!